GREAT NEWS! Cellar Bar is now Celon Lounge. 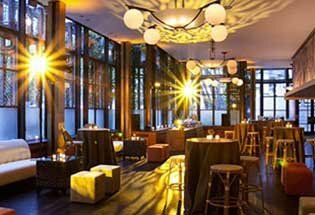 For event details, availability, and to purchase tickets, visit Celon Lounge New Years Party @ The Bryant Park Hotel. 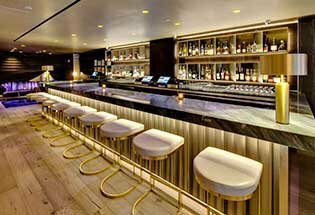 Cellar Bar, the swanky lounge under the Bryant Park Hotel, is located just two blocks from Manhattan's famed Times Square! With the best of both worlds -- the hustle bustle of Times Square and the calmer feel of NYC's Bryant Park, Cellar Bar offers glitz, glamour, and luxury. 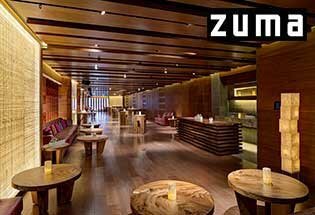 No surprise there given its prime location within one of New York's leading luxury designer hotels. You wouldn't expect anything less. With an ambiance bridging gothic cavern and modern urban lounge, Cellar Bar boasts a unique architectural structure unlike many others in the great city of Manhattan. Candelabras and antique-looking chandeliers hang from the arch-infused ceiling, candle-lit booths outline the perimeter, and crosses adorn the walls. Plush velvet surrounds the venue, giving it a hip and yet simultaneously comforting vibe. Definitely a sight to be seen for native New Yorkers and tourists alike. It is a pleasant crossroads of dark, mystical and cool. On any given night, you could find yourself next to celebrities, models and socialites. No wonder it was voted #1 most fashionable hotel in midtown. Cellar Bar makes for the perfect night out any day of the week… but particularly on New Year's Eve! Cellar Bar's NYE Bash is a not-to-be-missed evening full of fun, style and celebration! A ticket to this party gets you all you could want and so much more. You'll start off the evening right with five hours of premium open bar beginning at 9 PM all the way until 2 AM (of 2016 that is!). While you sip away on wines, beers and cocktails to your heart's content, get your dance on as a live DJ spins today's hottest beats all night long. Cellar Bar is made for music - the beats bounce off of the vaulted ceilings, shaking the chandeliers and taking the vibe from fun to totally on fire. It's like nothing else you've seen! Drinking and dancing are grand… but fear not, food is too! Mini buffets will be available from 9 until 11:30 PM for when your stomach needs a little sustenance after all that dancing and merry-making! You will be lacking for absolutely nothing at this hot true New York nightlife mecca. Watch the clock strike twelve into 2016 with a complimentary champagne toast! 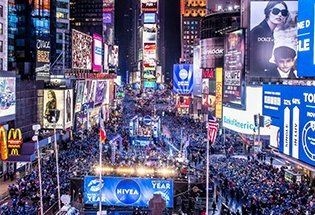 Cheers to the ball drop just blocks away and to the new year ahead while you continue to party it up for two more hours! If you're feeling super-special, treat yourself like the celebrity you are to a VIP table option and relish in the VIP treatment with luxurious leather banquettes and private bottle service. Either way, you won't want to pass up this epically awesome bash. Get your ticket to the cellar celebration now!